The Wilder Volatility Stop was introduced by Welles Wilder in his book, “New Concepts in Technical Trading Systems.” It adds or subtracts a multiple of the Average True Range (ATR) to the “significant close” in order to calculate the stop. The indicator also has the option of using a Donchian channel as anchor point to calculate the stop. The Wilder Volatility Stop calculates the long stop by subtracting a ATR multiple from the “significant close” in the lookback period. In an uptrend the “significant close” is determined as the highest close since the start of the trend. Conversely, the short stop is calculated by adding an ATR multiple to the “significant close”. In a downtrend, the “significant close” is determined as the lowest close since the start of the trend. When used with time based bars, the volatility stop adjusts to the current market environment. This allows for stop widening when volatility increases and tightening when it decreases. Wilder used a default lookback period of 7 bars for his volatility stop. When used with longer lookback periods, the “significant close” may be replaced with a Donchian channel calculated from the bar closes. Using the Donchian channel is the standard approach for calculating the Chandelier Stop. In such a scenario, a longer lookback period, typically 22 bars, is generally applied. By activating this option, the long stop is calculated by subtracting a multiple of the ATR from the Donchian high in the lookback period. Conversely, the short stop is calculated by adding a multiple of the ATR to the Donchian low in the lookback period. 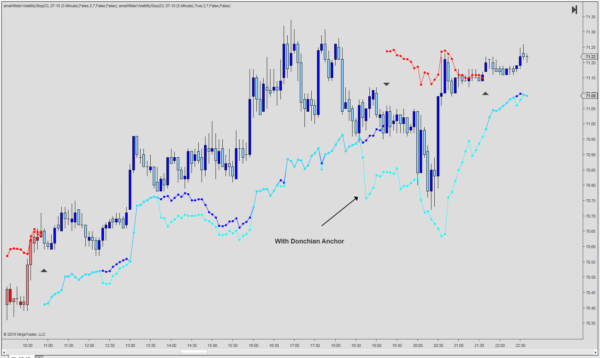 The Wilder Volatility Stop also comes with an option of activating the traditional trailing stop feature. When that option is selected, a stop widening is not permitted. By increasing volatility the stop will only move in the direction of the current trend. The trend information is exposed through a public Series<double>. The trend can be accessed directly via an automated trading strategy, or the market analyzer.